Mom died early this morning. We were with her last night. My wife spent Monday night with her in the adjacent bed. Dementia is a horrible disease. We are both glad that her energy is not trapped in a wasted body. Now we are heading to tell Pop. This is not easy. Thankfully, Hospice will be with us. Thanks for your thoughts over the past week. I took this photo of her and her daughter's hands yesterday. I am sorry for you both. Peace be with you both in the days ahead. Her work here is done. She is at peace. Offering strength and courage in this difficult time. I hope you find solace. 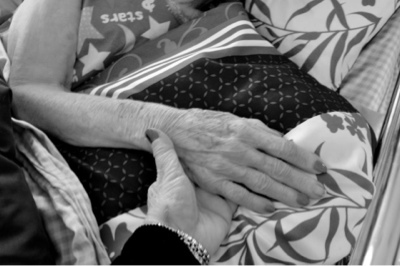 That photo was so strong for me as I remember on the day my mother died being in the ICU and holding her hand. I remember thinking that was the first time we had ever not squeezed hands. My thoughts and prayers are with you both. You both have paid her parents a great honor by attending to their needs. Many children don't do that. So sad for your loss. I won't put anything pithy or cliche'. God be with you. Syd, sending you and C. so much love today. Take good care of yourself in your time of grief, Syd. God bless you and C. Death is so ugly. My prayers are with you both and your FIL. My thoughts and prayers to you and C. It's never an easy thing to go thru. I am so sorry for your loss. Sending light and love to you all. You have been on my mind a lot the past few days. Bless her, and bless you both. So sad for you, but relieved for her, she is no longer stuck. So hard for your FIL. He has lost his love and must feel very alone. Such a sweet post and a moving photo--our thoughts and prayers are with you. God bless your family and give you grace for the days ahead. I'm so sorry. Crying as I type this. Please know you, C and your Father in Law are in my thoughts and prayers. So sad for you all but your Mother in Law is no longer trapped and imprisoned by disease or suffering. She is free. My sympathy to C., her dad, and you - wishing you all strength in the days ahead. I'm so sorry for your loss, Syd. I cannot even imagine what you are going through right now. You are in my thoughts. I'm so sorry for your loss. Thank for sharing the lovely photo. 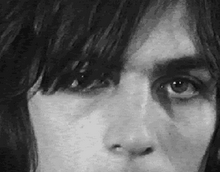 Be Well Syd. Life is still for the living. Chart the course of your emotions well and safely comfort your wife that she may comfort you. Syd, I am so sorry, it is hard to lose someone, no matter how long you have expected it. Please take care of you and C.
The photo touched me in a very deep way. The fact that she had a manicure on her deathbed is a beautiful thing. Someone (probably C?) took the time and lovingly polished her nails. My deepest sympathies to you and C. I'll keep you all in my prayers. So sorry for your family's loss Syd. She will live in your hears and minds forever. I lost my own mother in October and miss her dearly. My thoughts are with you, your wife and father-in-law. May you find comfort in happier memories of her before the dementia took hold. I can imagine how mentally and emotionally exhausting it was for you and C to go through this process. She was very fortunate to have people like yourselves around at a time like that. I'm sure it meant a great deal. Even if her body didn' sense due to the dementia. It's Very gritty and real. I'm sure you were both tremendously helpful. I hope you both have had a chance to rest now. ..now that my computer is faster than the incredibly slow crawl it used to be, I will be able to be more lively on the blogger scene. I wish you and C well Syd..